Suffolk County Judge Stephen Ukeiley and Boulevard Books collaborate on a chidren's book that puts cool back in school in an era of constant testing and punitive common core standards. "A school where imagination is valued as students learn and have fun." Boulevard Books announces the publication of Judge Stephen Ukeiley's new children's book titled The Silly School. 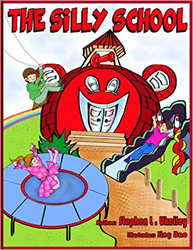 Judge Ukeiley creatively brings to life the joy of learning in a fun-filled classroom of imaginary characters and animate objects, including the talking mirror, hydraulic lift and indoor swings. Judge Ukeiley's inspiration came from a visit to his child's kindergarten class where he experienced the overwhelming joy of reading a rhyming story to the class. The theme of The Silly School is that learning may best be achieved in an environment conducive to the students' interests. Of particular significance, the book combines education and recreation to maximize learning while emphasizing the unbound limits of a child's imagination. "I am proud to have created an unique classroom where learning and child development is achieved through play. While certainly a fictional work, this is precisely the type of book that reinforces real-life parental goals and hopefully leaves a lasting impression that learning can be both challenging and enjoyable," said Ukeiley. "Illustrator Jing Bao expands upon the meaning and focus of the children's school in her colorfully bold, descriptive and eye-catching drawings," said Avi Gvili, President of Boulevard Books. Gvili added that "This is the type of children's book which both the reader and child will immensely enjoy and forever remember." Judge Ukeiley is presently serving his second term as a duly elected Suffolk County District Court Judge. He is also an adjunct professor of law at both the Touro College Jacob D. Fuchsberg Law Center and the New York Institute of Technology. Judge Ukeiley has received several awards of recognition and has published numerous scholarly articles. He is also the author of The Bench Guide to Landlord & Tenant Disputes in New York, which has been distributed to more than 1,200 courts throughout New York State, and is a former member of the Board of Directors of the Suffolk County Women's Bar Association. Boulevard Books is an educational publishing company for the 21st century. Founded in 2010 by author and educator, Avi Gvili, Boulevard Books aims to publish those writers that illuminate the world in new and interesting ways.